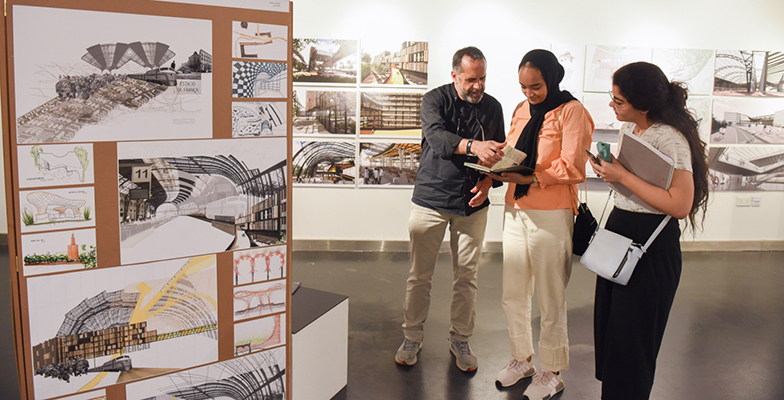 An exhibition of student work from the College of Architecture, Art and Design (CAAD) at American University of Sharjah (AUS) inspired by their semester abroad in Barcelona opened this week and will be in display on campus until April 7, 2019. The 15 undergraduate students were part of an intensive architectural program in the heart of Barcelona during the Fall Semester 2018. Their original works are a reflection and culmination of a study abroad experience that saw them traveling throughout urban and provincial Spain. Dr. Igor Peraza, Professor of Practice in the Department of Architecture, leads the Barcelona program, which will be held for the third year in Fall 2019. The program is one of many international opportunities presented to students during their time at AUS. “The semester abroad in Barcelona is one of the unique opportunities that students of CAAD are offered during their time at AUS, confirming our commitment to the practice of experiential learning, which aims to produce work-ready architecture and design graduates of the highest caliber,” said Dr. Peraza. “Programs like this set CAAD students apart and provide them with the hands-on experience they need to take into the workplace. As a result of their time in Barcelona, these students now have the ability to utilize their first-hand cultural and historical understanding and apply their technical skills taught by world-class instructors to create meaningful designs that will have an impact on the industry and the region,” Dr. Peraza said. In addition to taking part in study abroad programs, AUS students have opportunities to attend international conferences, participate in regional sporting events, and take summer study tours abroad in order to be immersed in different cultures. These experiences allow AUS students to be better prepared to work in globalized workplaces and to have rich life experiences before they graduate. The exhibition showcases works created as part of the architectural studio project, “Rediscovering the Rondas” (ring roads or beltways), which provided students with the opportunity to reimagine an existing space in order to make it more suitable for 21st century use. Students had to look beyond the basic purpose of the existing infrastructure and speculate new and imaginary architectural solutions of the future city. Dr. Peraza encouraged incoming students of architecture and design to visit the exhibition on the AUS campus and take the opportunity to explore the college’s outstanding facilities. “This exhibition gives incoming students an insider’s look at the creative process as experienced by a student of architecture at CAAD. As our students work in our studios and fully equipped labs, they have access to state-of-the art equipment to create full-scale models of their own designs,” he said. “To all aspiring young architects in the UAE, I highly encourage you to visit CAAD. I am confident you will be impressed by the high-quality work of our talented students and inspired by the wide range of creative opportunities we offer,” he said. The Barcelona semester abroad program comprises of a series of courses, including an architectural studio and case study, as well as classes in Critical Practice and Contemporary Discourse, and Place and Culture. The program is open to third- and fourth-year architecture students. For more information about the College of Architecture, Art and Design at American University of Sharjah, visit www.aus.edu/caad.